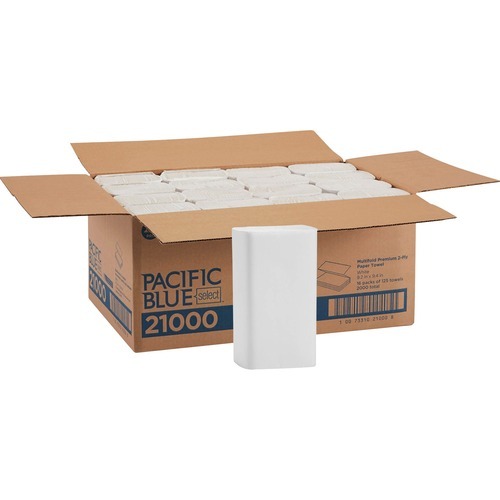 Georgia-Pacific Signature Multifold Paper Towel - 2 Ply - 9.50" x 9.25" - White - Absorbent - 125 Sheets Per Pack - 16 / Carton - Welcome to TABS! Durable, premium multifold paper towels fit all standard-sized towel dispensers for folded towels. Two-ply towels are ultra white and absorbent for restroom and industrial use. Folded size is 9-1/4 x 3-1/4"." Fold Size: 9.25" x 3.25" 9,25" x 3,25" Full Size: 9.50" x 9.25" 9,50" x 9,25"
Weight: 0.00 Manufacturer: Georgia Pacific Corp.